NETWORK FINALS: After adjustment for the preemption in NY, CW’s line-up lost 0.1, leaving ARROW at 0.4 and LEGENDS OF TOMORROW at 0.3. CABLE HIGHLIGHTS: ESPN’s MONDAY NIGHT FOOTBALL dopped 0.47 from last week’s game to 3.45. On VH1, LOVE & HIP-HOP lost 0.08 to 0.99, TI & TINY was down 0.11 to 0.55, and IN SESSION was at 0.22. USA’s WWE telecast was at 0.94/0.83/0.80, compared to last week’s 0.92/0.86/0.75. Bravo’s REAL HOUSEWIVES OF ORANGE COUNTY gained 0.03 to 0.55. On MTV, TEEN MOM was at 0.52/0.30, compared to last week’s 0.47/0.27. Nickelodeon’s noon PAW PATROL was at 0.47, and BUTTERBEANS CAFE was at 0.31. On Food Network, HOLIDAY BAKING CHAMPIONSHIP rose 0.05 to 0.45, and CHRISTMAS COOKIE CHALLENGE was down 0.03 to 0.31. 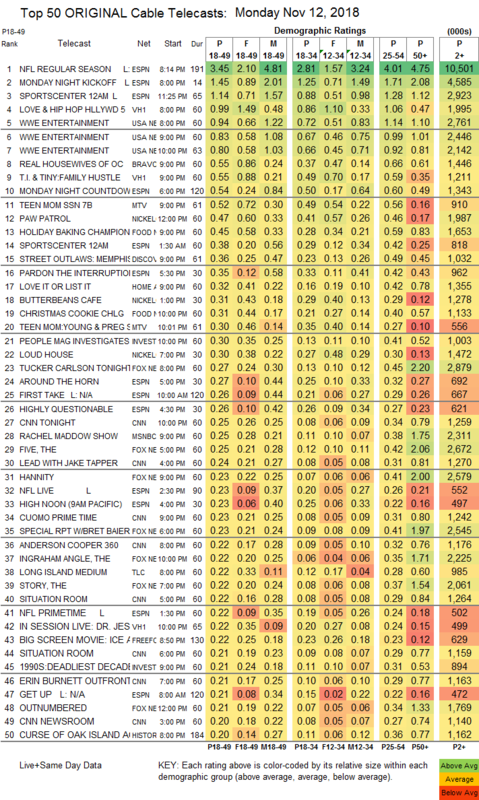 On Discovery, STREET OUTLAWS grew by 0.05 to 0.36, and RACE NIGHT AT BOWMAN GRAY was up 0.02 to 0.15. On HGTV, LOVE IT OR LIST IT jumped 0.13 to 0.32, HIT PROPERTY was at 0.17, HOUSE HUNTERS INTL stayed at 0.17, and HOUSE HUNTERS lost 0.03 to 0.15 . On ID, PEOPLE MAGAZINE INVESTIGATES gained 0.07 to 0.30, and DEADLIEST DECADE was up 0.04 to 0.21. Fox News’s TUCKER CARLSON TONIGHT led cable news at 0.27/0.45/2.9M, with CNN TONIGHT at 0.25/0.34/1.3M, and MSNBC’s RACHEL MADDOW SHOW at 0.25/0.38/2.3M. 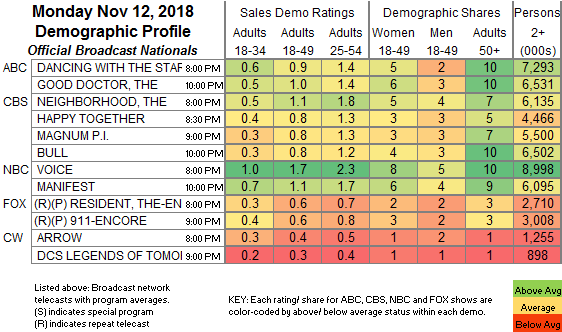 On TLC, LONG ISLAND MEDIUM rose 0.05 to 0.22, MAMA MEDIUM climbed 0.04 to 0.18, and LONG LOST FAMILY was steady at 0.16.